Today, we found out that our article “Prescriptive attitudes to English” is published, that it has been out for two months already. Thanks, Carmen, for tweeting about it, or I wouldn’t have known. Still, I’m really pleased, and expect Carmen will be, too: it is as interactive as we could make it, with loads of links (lots of prescriptivism goodies), and of course plenty of interesting (we hope!) content. We hope it will be widely read and quoted of course. 9 December: Save The Date! On 9 December 2016, the Bridging the Unbridgeable project will organise a usage guides symposium at the Leiden University Centre for Linguistics. Speakers will include Rebecca Gowers (author of the revised edition of Plain Words and of the recently published Horrible Words), Oliver Kamm (author of Accidence will Happen), Harry Ritchie (author of English for the Natives) as well as the members of the project, including Robin Straaijer (who recently published a review of the 4th edition of Fowler’s Modern English Usage by Jeremy Butterfield). Further details about how to register for the symposium will follow soon. Robin Queen and Julie Boland, both from the University of Michigan, recently conducted a study on attitudes towards spelling variation, which has now been picked up by The Guardian. What they call “typos” and “grammos” are errors everyone has come across when using the internet and computer-mediated communication. 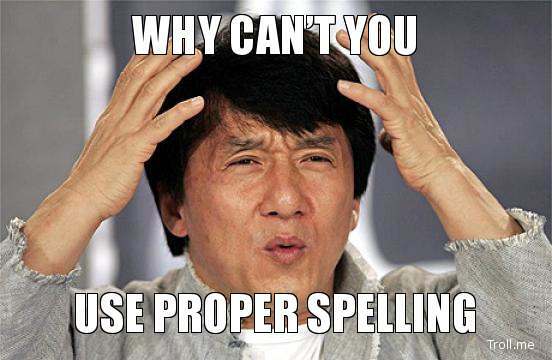 Numerous internet memes illustrate computer users’ outrage about spelling mistakes such as the one below.